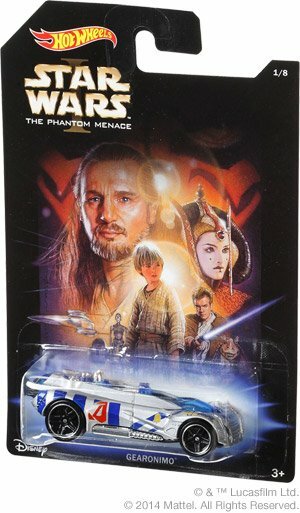 Each vehicle is based on an existing Hot Wheels car, but with deco inspired by the movies - the Gearonimo is based on Anakin's Pod Racer, and the Spectyre looks like Luke's X-Wing helmet. While not based on vehicles from the movies or the characters themselves, this batch continues a proud tradition from over the years. Believe it or not, there are a lot of nifty cars dating back from the likes of Sega, Barbie, and more recently Star Trek on the chassis of these collectible cars - but the window for getting the good ones tends to be short, so your vigilance is required here. Anticipate disappointment in your hunting, is what I'm saying.